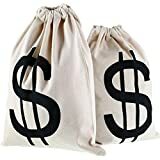 Do you remember those little canvas bags of money with a dollar sign printed on the side of them in cartoons, comic books, movies, robberies on tv, board games, et cetera? Well, they actually exist! 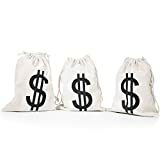 These cool new Dollar Sign Money Bags are the ultimate in whimsical yet heavy-duty coin and currency storage or transport. 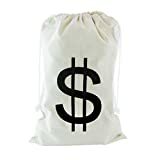 They're made from tough natural cotton canvas with double stitched seams are imprinted with a "$" in black ink. 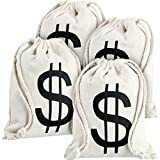 Now there's no way you'll mistake your huge pile of money bags with your bag of rocks, bag of marbles, bag of bottle caps, or bag of whatever. Hmm, maybe the dollar sign on the side will make them a bit too obvious while hauling it to the bank? Still cool though and great for pranks too.